Help St. Johns Church to make a joyful noise! No musical background is required to join the choir. Rehearsals are held on Thursday nights in the Sanctuary at 6:30pm. 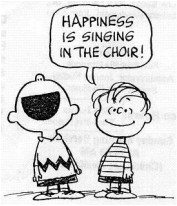 We sing weekly September through May, and about every other week during the summer.